The “extraordinary” (Classical Voice N. America) soprano Mary Bonhag is captivating audiences around the country with her “marvelous versatility” and “supple, expressive” voice (San Antonio News). As a new music specialist, Mary made her Carnegie Hall solo debut in 2009 and orchestral debut with the American Symphony Orchestra in the same year. She is co-artistic director of Scrag Mountain Music with her husband, composer/double bassist Evan Premo. Together they organize chamber music residencies and innovative and affordable concerts around VT. A consummate collaborator, Mary has performed with the Aizuri Quartet, Decoda, Spektral Quartet, as well as chamber music festivals around the country including Cactus Pear (TX), San Francisco Contemporary Players, 21st Century Consort, and Yellow Barn. 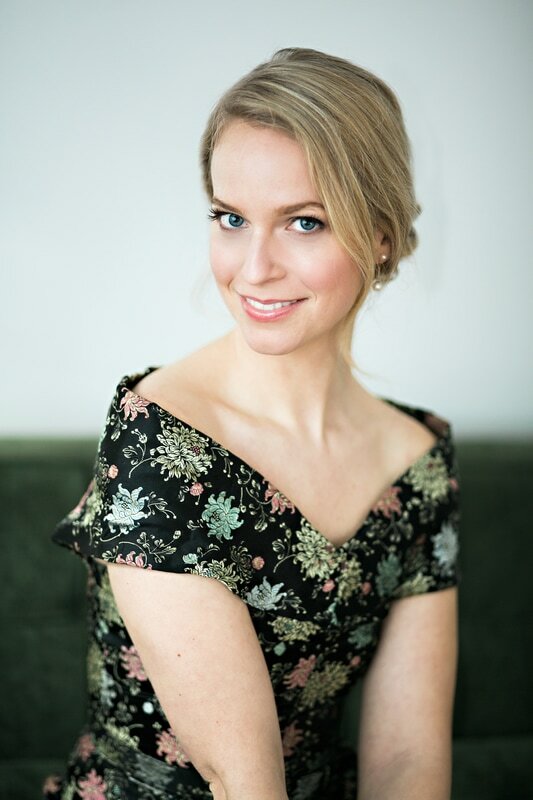 As a recitalist, she has been presented at Dartmouth, Smith, Goucher, and University of Vermont, and has had fellowships at SongFest and Tanglewood where she received accolades from faculty and press. Mary has premiered and commissioned works by Lembit Beecher, C. Curtis-Smith, Premo, Shawn Jaeger, and Evan Chambers. She has been featured on the NPR shows Performance Today and From the Top and appears on Albany Records. 2017-2018 highlights: Mary sings Shawn Jaeger’s The Cold Pane with TURNmusic, St. John Passion with Middlebury Bach Festival, is in residence at the University of Michigan School of Music, sings Mozart’s Mass in c-minor with Onion River Chorus, presents the vocal tour-de-force Sequenza by Luciano Berio with Scrag Mountain Music, and returns to Tanglewood for a second summer as a vocal fellow. Residencies at Yellow Barn workshopping a new piece by Susan Botti for three voices and at Avaloch Farm working on trio repertoire with flutist Catherine Gregory and harpist Mélanie Genin, mini-concerts at the Kent Art Museum, Norwegian early music at Beethoven and Banjos Festival, co-curating a chamber music concert for the Vermont Symphony Orchestra's Jukebox series, Schoenberg's Quartet no. 2 with award-winning Aizuri Quartet both at Scrag Mountain Music and 5Boroughs Music Festival and more! ​In between travels, she and her husband Evan make music and homestead in Vermont where they tend to their two young boys, animals, and gardens. Read the Boston Globe review of Mary's recent performance of Niccolò Castiglioni's Cantus Planus. And here is a performance from July 17 of Grieg and Sibelius songs! I am having an inspiring time again this summer, thank you all for your well wishes from near and far. I have one more big concert with the orchestra--Witold Lutoslawski's Chantefleurs et Chantefables on August 13 and a variety of vocal ensemble music Aug. 19. See the Schedule page for details.